WordPress seems to have a new layout/interface/whatever it is, and I love it. It seems very fresh and hip. And yeah, I realize I sound lame using the terms “fresh” and “hip.” Don’t judge me. In other news, my husband and I have been going on walks every evening after dinner lately (and by lately, I mean Monday and Tuesday, but we’ve started going on some a few weeks ago, once or twice a week), and I love it. It’s a great way to earn 2 activity points, it allows us to explore our neighbourhood more, gives the dog exercise, gives US exercise and fresh air, and allows us to have some quiet time without the distractions of cell phones and Netflix. 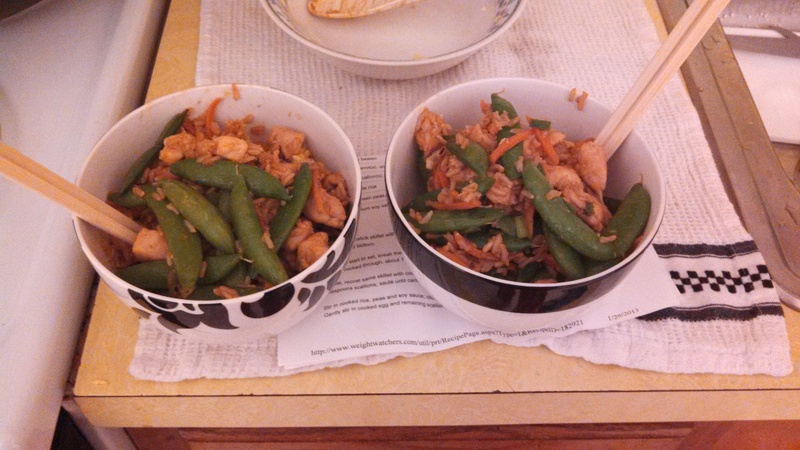 Two nights ago I made chicken fried rice, which was slightly adapted from a weight watchers recipe. It was really yummy and filling – and I love dishes that incorporate veggies into the main dish – a great “one pot dinner”! Side note: I added sriracha sauce to my bowl to give it some heat. -Coat a wok with cooking spray and heat over medium. Add eggs; tilt pan so that eggs cover bottom. -When eggs start to set, break them up into pieces with a spatula or wooden spoon. Cook until eggs are cooked through, about one more minute, then remove and set aside. -Recoat the wok with more cooking spray and set over medium-high heat. Add the kitchen and toss until cooked through. -Add carrots and all but 2 tablespoons scallions and saute for 2-3 minutes. -Stir in cooked rice, peas, hoisin sauce, sesame oil and soy sauce; cook until heated through, stirring and tossing often. -Stir in cooked egg and remaining scallions and heat through.